Though a tremendous color scheme for a funny car, I found the red, white and blue to be a bit much for the day to day. My high school history teacher would liven up his slide presentations with gratuitous photos of bicentennial fire plugs. I had always called them fire hydrants, but he was the expert. Not counting the tax-deductible travel costs, the collection was modestly priced, more varied than you would think and, as a photo album, compact. Not surprisingly, he said that it was getting harder and harder to find new bicentennial fire plugs to add to his collection. Rather than the go-go patriotic theme, I chose a palette more befitting a mulch pile. 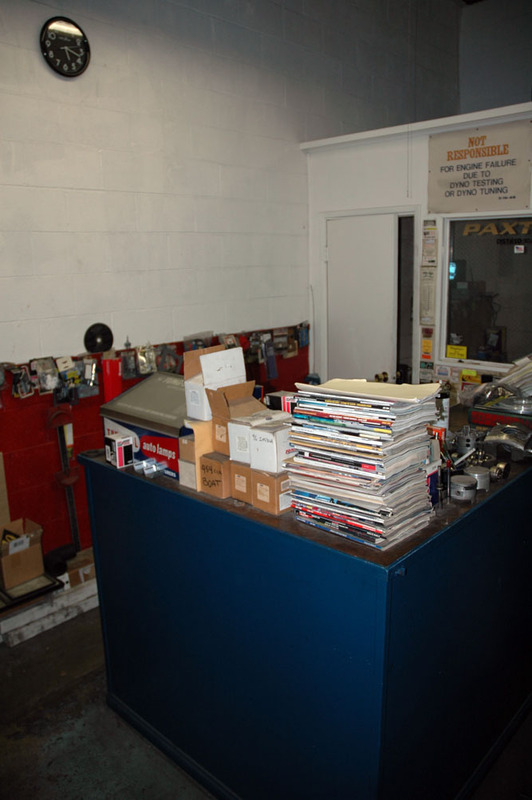 The counter is the natural hub of Hooptyrides and, despite countless work benches, I end up doing a lot of work at the nucleus of the operation. It only made sense to install pegboard to store the most commonly misused tools. That is a 4x8 expanse of handy. 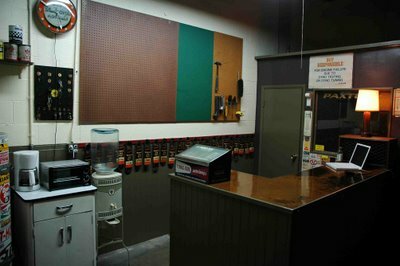 A 4x4 slab of pegboard, a 2x4 sheet of masonite painted with chalkboard paint and a final 2x4 sheet of pegboard to round it out. The whole shooting match is hung on a perimeter frame made of old pallet wood with a couple vertical members on each side of the chalkboard. So, why no posting to Hooptyrides? I have been a little busy. Mister Jalopy on the TV! - Canadians will be able to see Mister Jalopy discuss garage sales, giant ipods and why it is worth smashing your thumbs for glory on the Discovery Channel Canada's Daily Planet show. Maybe April 4th, maybe April 5th. Whatever the case, those that miss it (including non-Canadians) will be able to see the archived show on the Daily Planet site. Maker's Faire - I will be attending the Maker's Faire with the Country Squire, the giant ipod, my copystand and my new hack - an 80's Panasonic Boombox with a Playstation LCD screen, TV tuning and remote control! Visit Mister Jalopy's Garage to see my cool junk, learn to punch and pop rivet sheet metal, see the $15 close-up photography rig, listen to the Ipod, watch the boombox TV and attend my workshop, How to Buy, Live, Tune and Die with Old Cars. We will tune-up the Country Squire - live! Jalopyjunktown.com - I have been too busy to post to Hooptyrides, so what do I do? Solve it like the North Koreans would! Resolve issues by introducing new problems that dwarf the original! Inspired by the Mad Professor, Jalopy Junktown is a more frequently updated site with cool stuff that I come across and the riveting, weekly garage sale update on the best item of the week. Boss, right?! 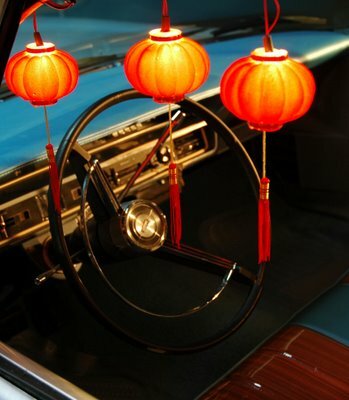 70's-style low rider dingle-berries by the way of Chinatown red plastic Christmas tree lanterns running off battery power! Why? Well, it really creates a stir when you go cruising in a Buddhist temple. Can't wait for the Make article? Re-wire from the stock serial wiring to parallel and connect to a 7.2V remote control battery. Come to the Maker's Faire and check 'em out up close and personal.